Bridges. I love bridges. There is something inherently beautiful about these structures that are designed to connect people and places. Over my years of traveling the world, I have crossed some of the most beautiful bridges on the planet and cautiously ventured across others. 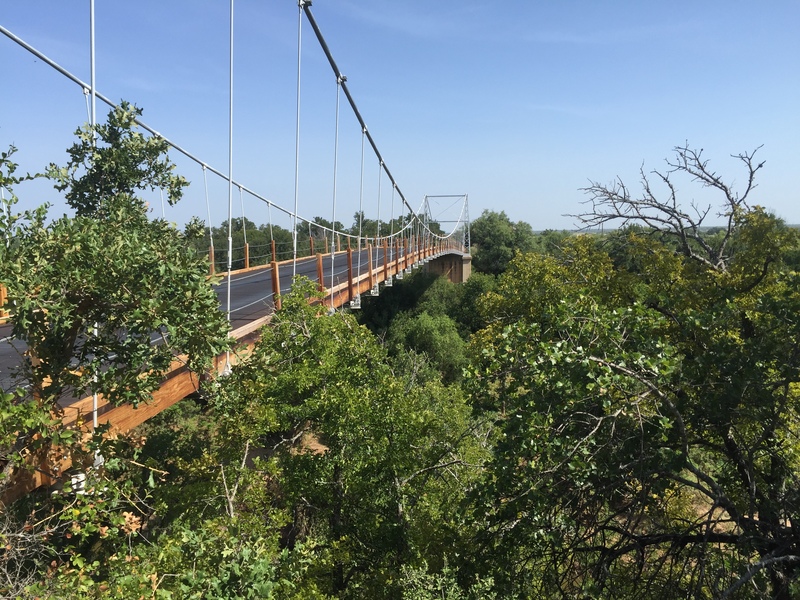 As a fan of Texas Country Reporter, I have long been fascinated by the one-lane suspension bridge featured in the opening segment of the show — the Regency Bridge. 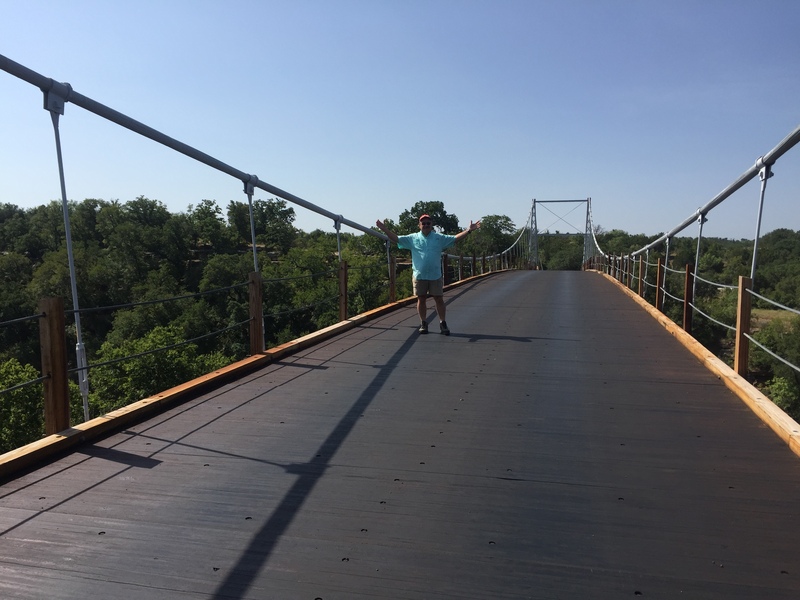 This beautiful bridge spans a remote section of the Colorado River on the Mills-San Saba County line. It is, perhaps, a little known fact that Texas has more bridges than any other state in the Union. 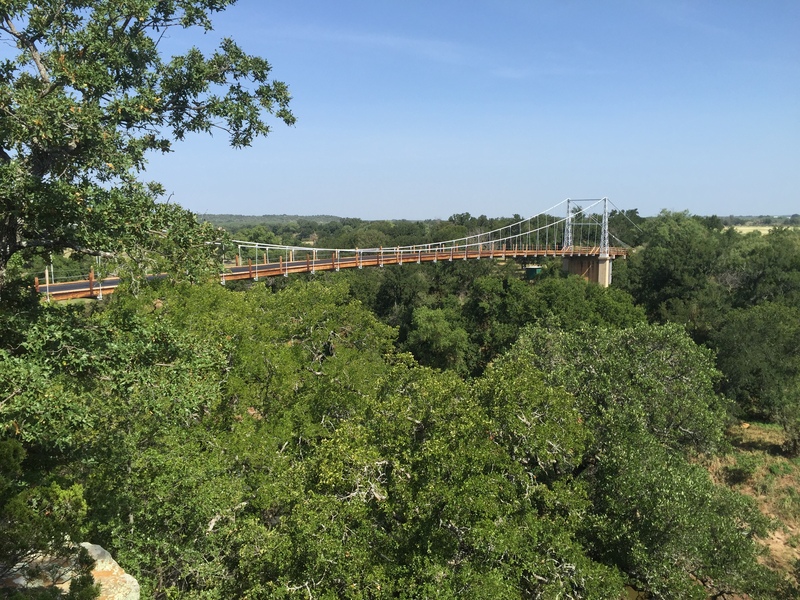 And, of the more than 52,000 bridges in the Lone Star State, the Regency Bridge is the last suspension bridge in the State that is open to automobile traffic. That alone makes it worth a visit. The iconic suspension bridge gets its name from Regency, a now-abandoned farming community on the Mills County side of the Colorado River. The first bridge built at the location in 1903 collapsed under the weight of a herd of cattle. A second bridge was destroyed by a flood in 1936. The current Regency Bridge was built in 1939 and repaired and rededicated in 1999. In December 2003, kids shooting off fireworks accidentally started a fire on the wood decking, burning a hole in some of the planks. The bridge was repaired and today remains open to vehicular traffic. 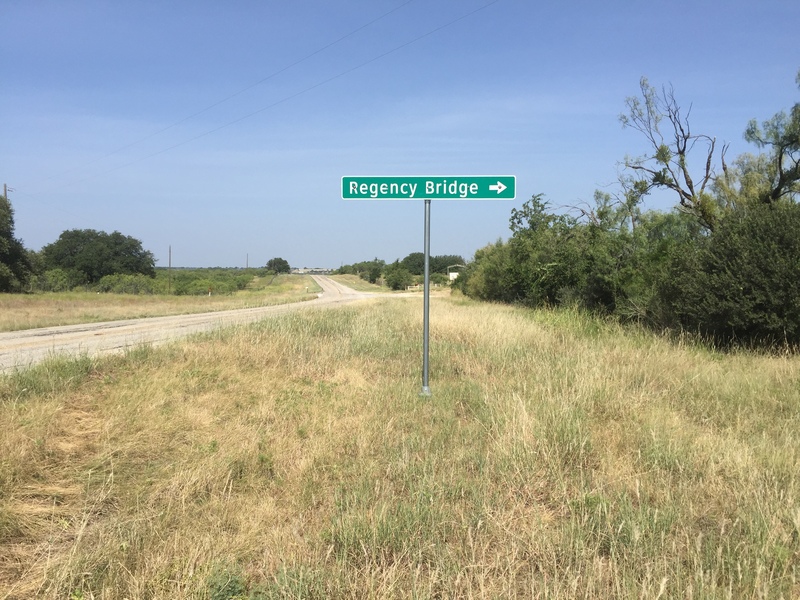 The Regency Bridge is located at the intersection of Mills County Road 433 and San Saba County Road 137, both gravel roads. 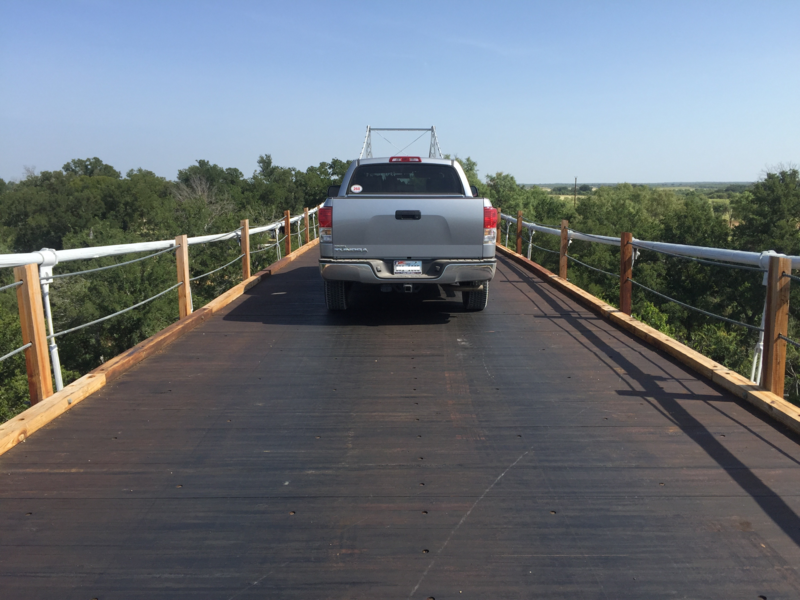 There is room to park on the Mills and San Saba sides of the bridge. The views from the bridge of the Colorado River and the surrounding countryside are absolutely beautiful. If you find yourself anywhere near the Regency Bridge, make it a point to take a detour to drive across the bridge and to stop and enjoy the scenery. The bridge does not get much traffic because it has been bypassed by newer paved farm to market roads. That makes it even better and possible to enjoy the bridge and the vistas for long uninterrupted periods. 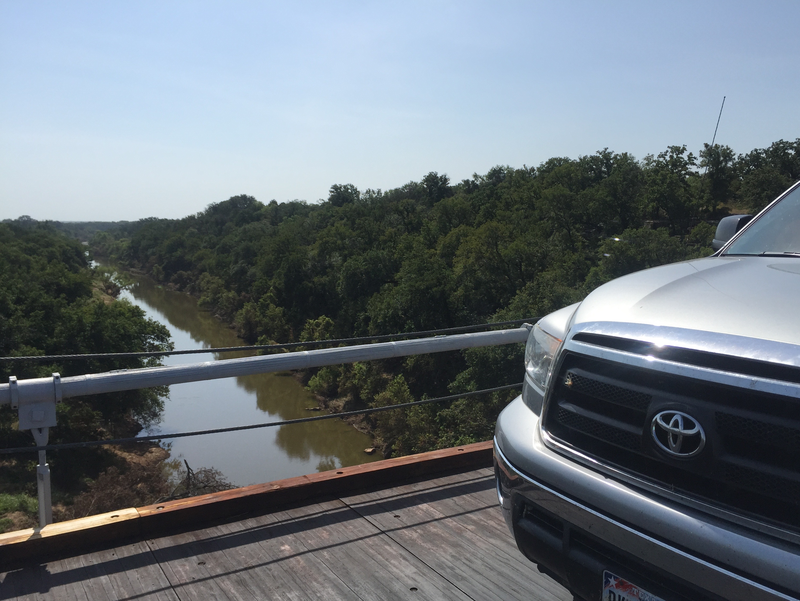 This entry was posted in Road Trips, Texas Rivers and tagged Regency Bridge, Suspension Bridge. Bookmark the permalink. 1. My wife and I hiked to Gorman Falls in Colorado Bend in October before checking out the trailheads on the Lake Mineral Wells Trailway between MW and Weatherford. The Trailway is crushed stone and I wanted to see what bike to bring on a future trip. Went by the bottling company and bought some “Crazy Water” (also available at HEB). On that trip, we went to the National Cowboy Hall of Fame and Western Heritage Museum in OK City. Maybe not Texas, but you need to put that on your bucket list. Absolutely fantastic! After driving on some of Rte. 66 in Texas, we wound up in Dalhart to listen to a performance by my favorite cowboy singer (as opposed to C&W), Don Edwards. I have listened to his singing for years(Don is 76 and performs at a lot of the cowboy gatherings/poetry readings in the western U.S.) Lives on a ranch outside Hico. I love his cowboy ballads and his gospel music. BTW – His performance was at the historic La Rita Theater, a 1920’s-era movie theater restored and converted to a live performance venue. Credit to the folks in Dalhart; what a restoration! 2. I did a 10-mile route on the Caprock Canyons Trailway a few years ago – one that goes to the tunnel. Great surface on the 5-mile length, but I saw that the surface really deteriorated immediately thereafter. I’d like to go back and check out the other starting points, as you did. I stayed at the Hotel Matador B&B in Matador. What a restoration there. I brought my jeans/boots with me and sat on the leather sofa in the lobby sipping a little Scotch from the flask that I brought – pretending I was big time cattleman about to do a deal with the Matador Land and Cattle Company. The ranch headquarters are just outside of town. The next time you are in Turkey, go by the Bob Wills Museum. A lot of artifacts from one of the greatest C&W band leaders of all time. 3. I remember the first time that I went to the Regency Bridge – Drove 15 miles out from Goldthwaite and turned left, only to be met by a sign that said, “Bridge out 7 miles ahead.” Well, I thought that I have come this far, I might as well go see what it looks like. Of course, this was during the 2003 restoration. I have since driven over the bridge several times. 4. I’m leaving Sunday for Guadalupe Mountains National Park, to hike Guadalupe Peak, probably Monday – a few days before my 75th birthday on Nov. 13, Friday. Hope to do McKittrick Canyon Tuesday if I have any steam left. Wish me luck; the legs seem to be in good shape, thanks to cycling, tennis, and hiking. Let me know if you are ever in the San Antonio area; I’d like to meet you. I do get over to Houston on occasion; my son lives there. So glad to hear from you and to read about your adventures. Glad to hear that you will hike Guadalupe Peak. Love that hike. I am scheduled to go back with friends to hike it again. I still need to hike McKittrick Canyon. You will love the vistas along the way. Hoping to try Bobby J’s, the hamburger joint you recommended, in Bandera. I am doing a two-day road trip with a friend in a couple of weeks to Enchanted Rock and Lost Maples. Hope to eat a burger there on the way back to Katy if timing works out. Stay in touch and let me know how your hike goes. Where were you standing when you took the first picture of the bridge? North or South side of the Colorado River? I plan to head that way in the near future and would like to get that same viewpoint. I approached the bridge from the north side and was facing south. Enjoy your visit.